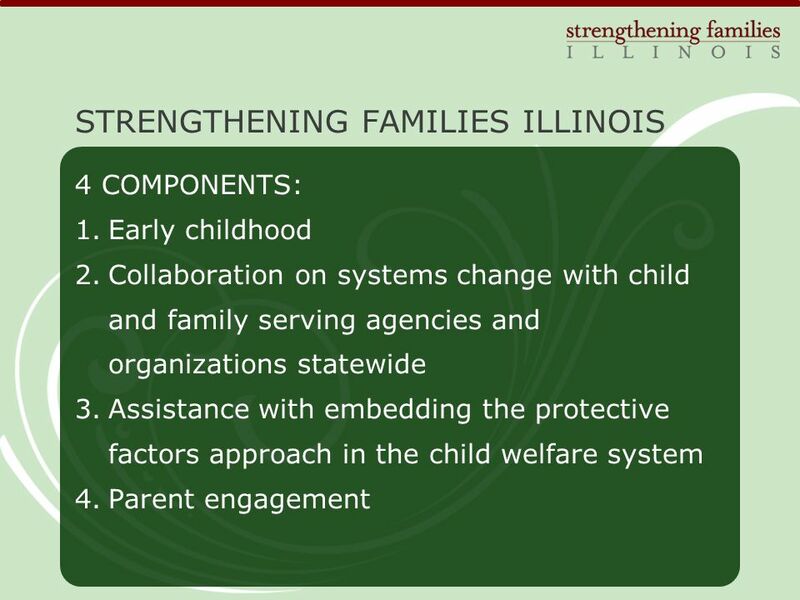 Strengthening Families Illinois Early Childhood / Child Welfare Collaboration November 3, 2011. 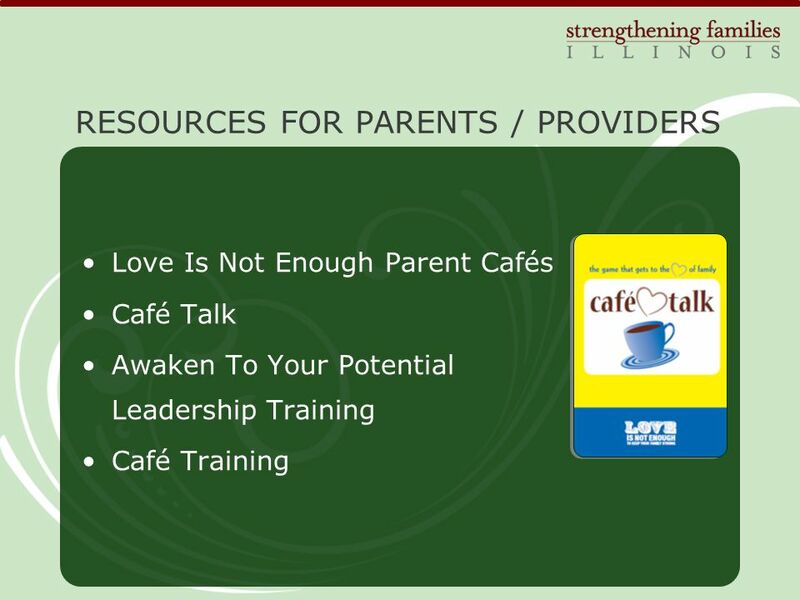 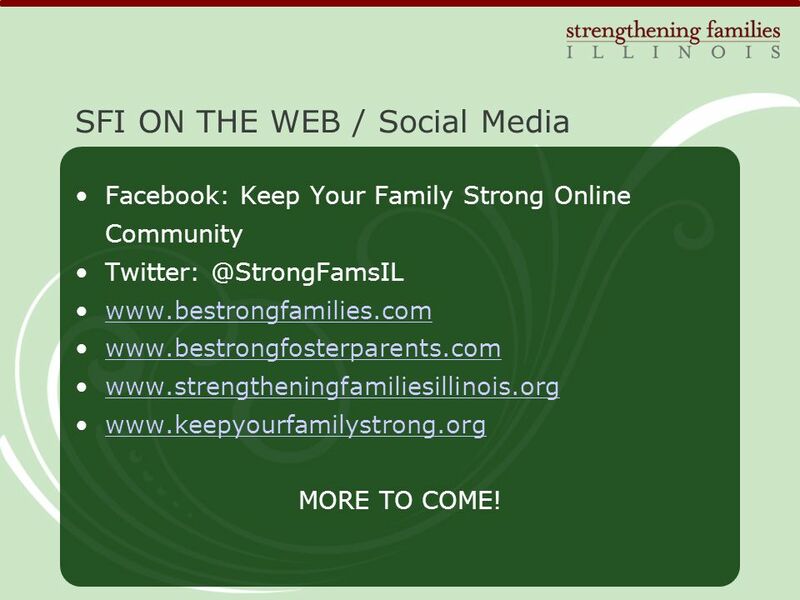 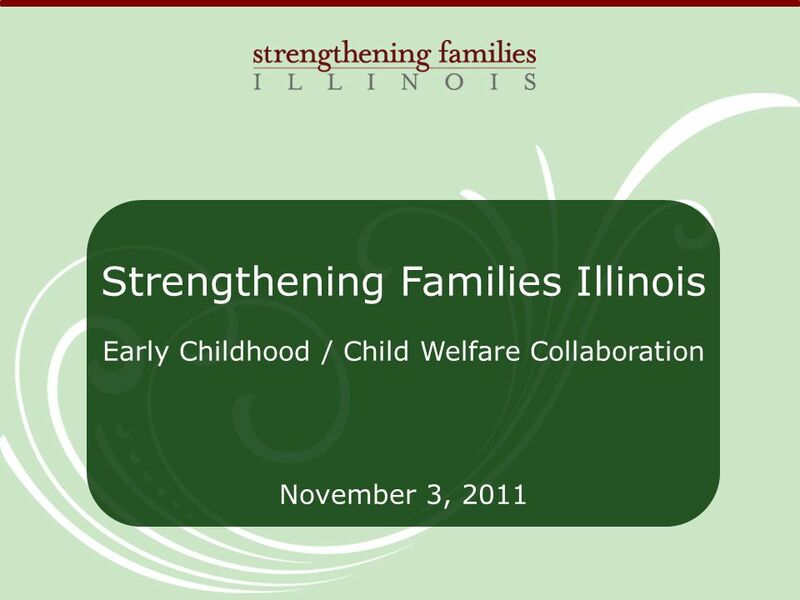 Download ppt "Strengthening Families Illinois Early Childhood / Child Welfare Collaboration November 3, 2011." 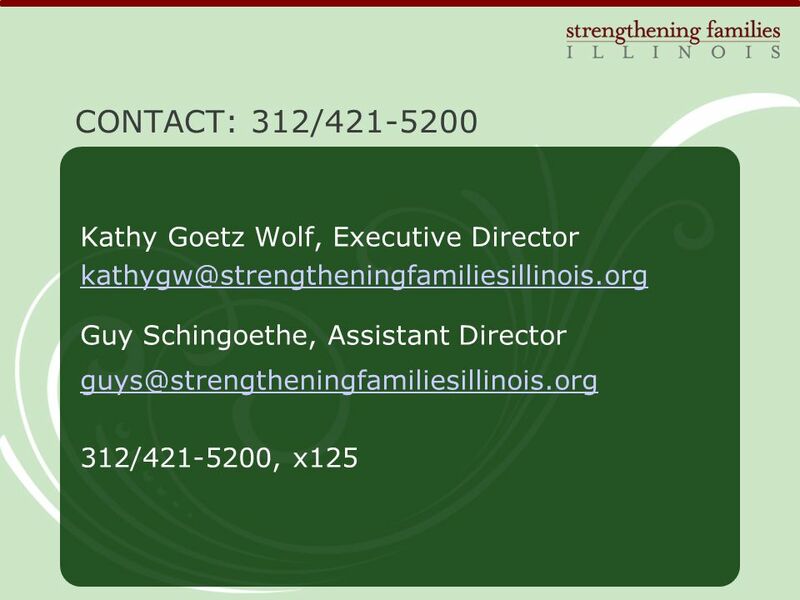 Your Contact Information Here. 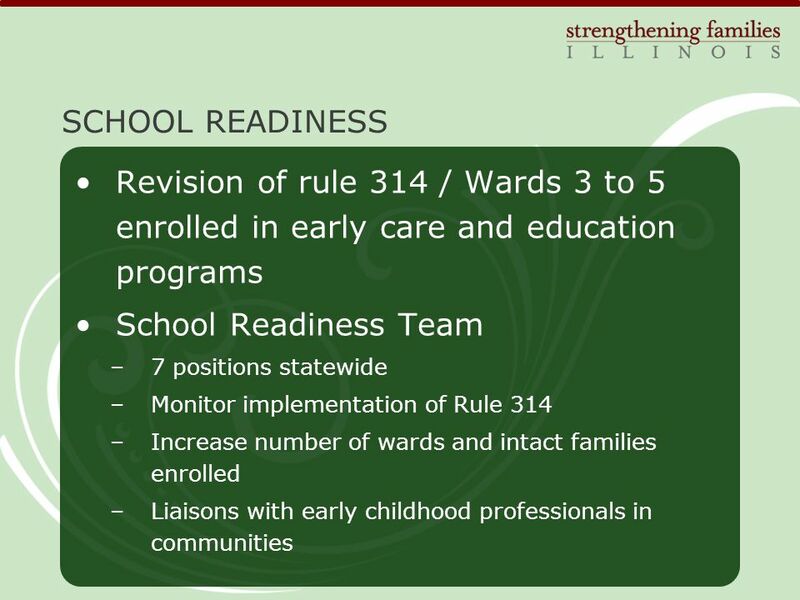 Preschool Closes the Readiness Gap There is a growing recognition in California and across the nation of the importance. 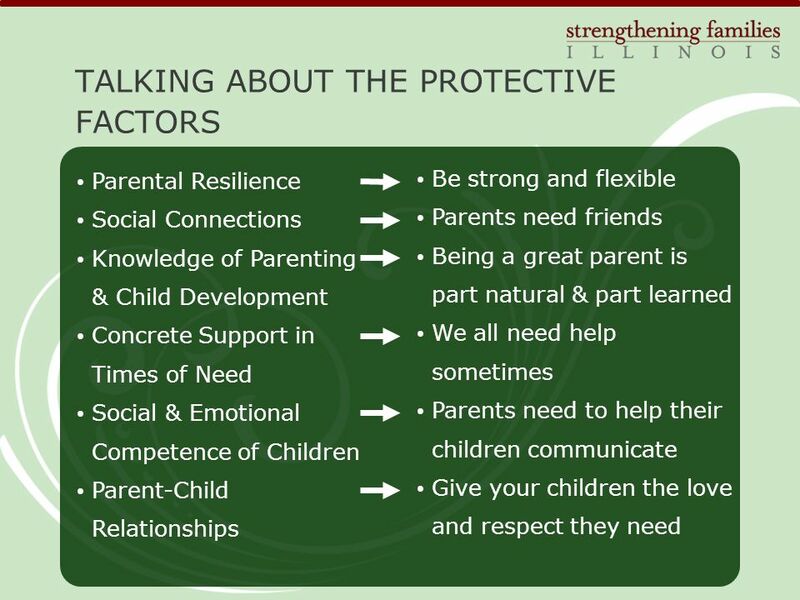 Response to Recommendations by the National Association of Child Care Resource & Referral Agencies (NACCRRA) The Massachusetts Child Care Resource & Referral. 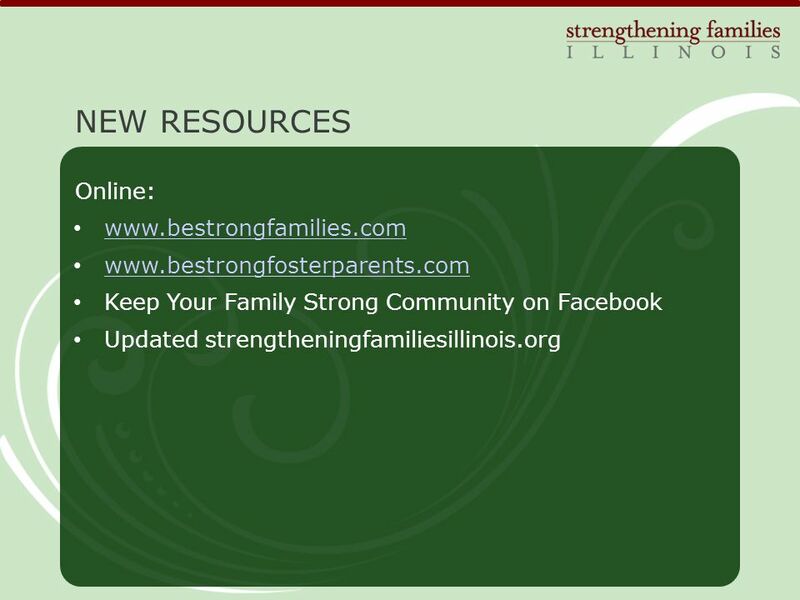 Children and Family Services Directorate Information Session. 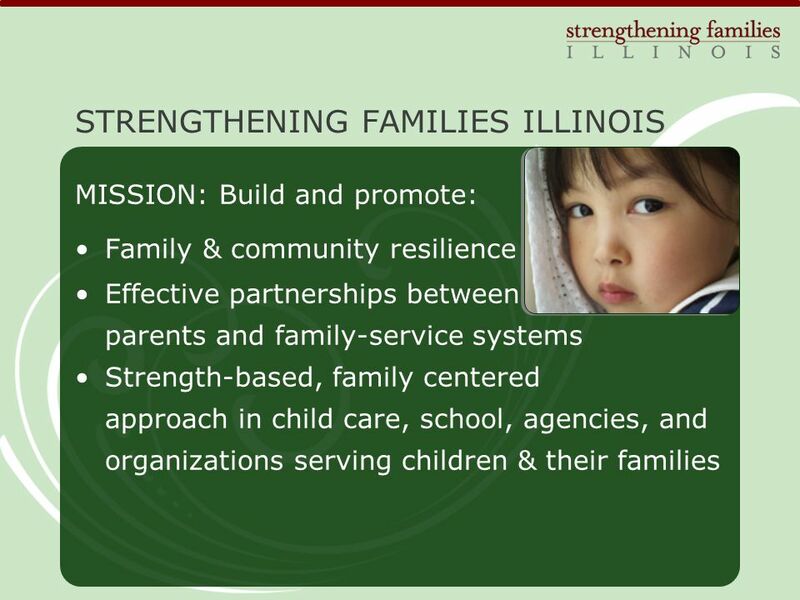 Strengthening Families, Protective Factors and State Partners: An Approach to Prevent Child Abuse & Neglect September 22, 2011. 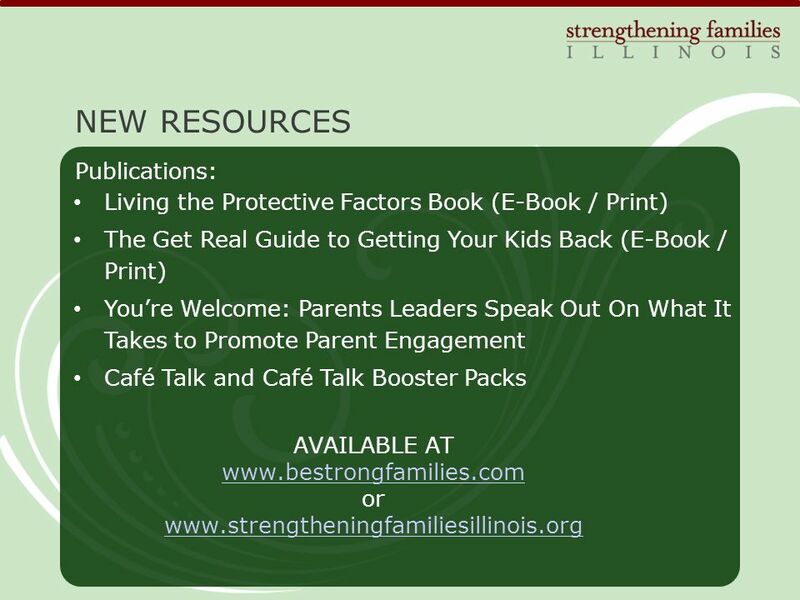 Effective Practices for Preventing and Addressing Young Children’s Challenging Behaviors Mary Louise Hemmeter, Ph.D.: University of Illinois at Urbana-Champaign. 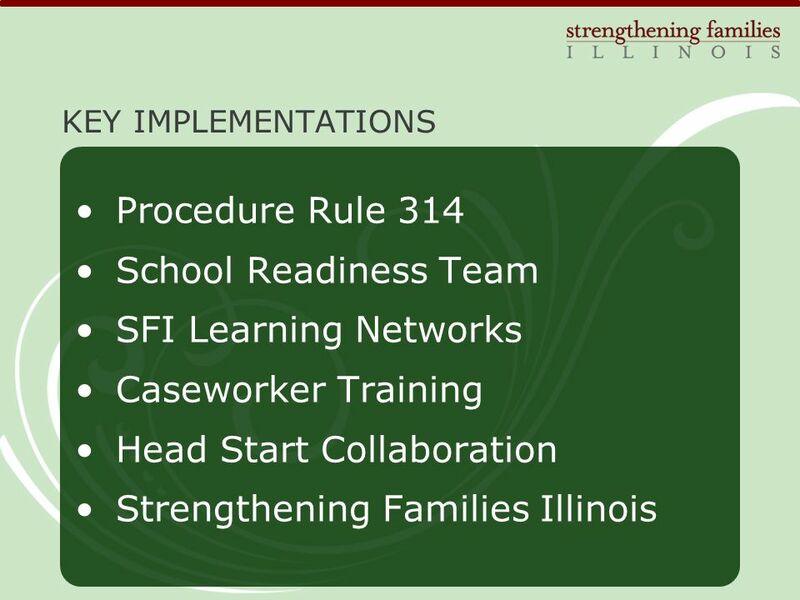 Policies and Procedures: Issues for Implementation, Policy and Scaling up Barbara J. Smith, U. of Colorado at Denver and Health Sciences Center Policy. 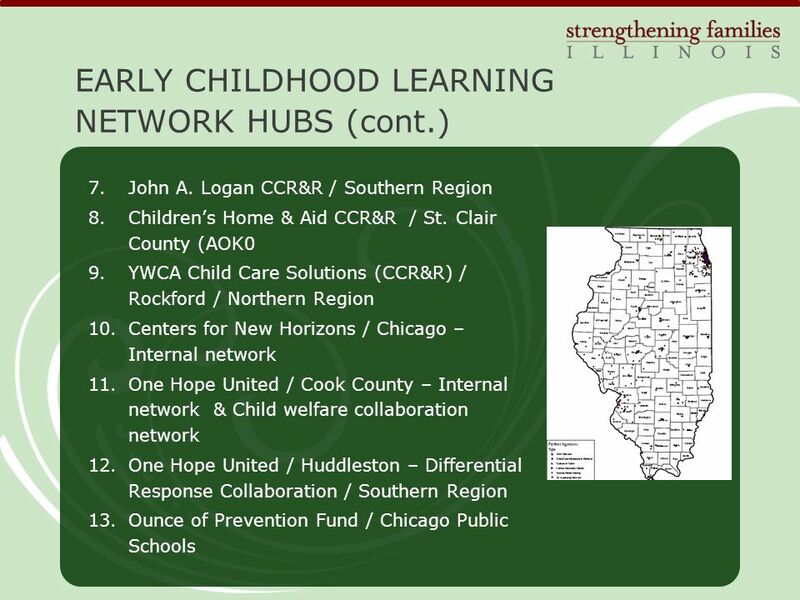 Common Ground One Approach, Many Adaptations Judy Langford June 2011. 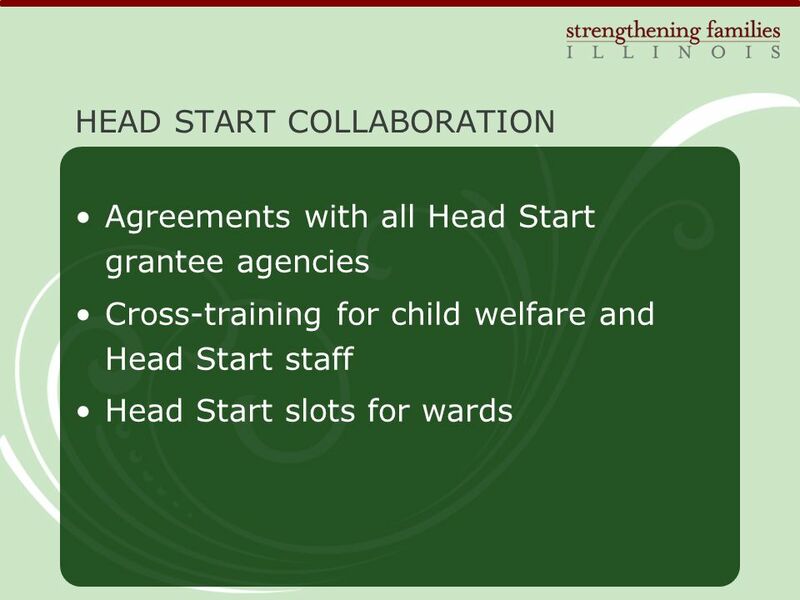 1 A Call to Advocacy: Pennsylvania’s Early Childhood Initiatives Office of Child Development and Early Learning 2008. 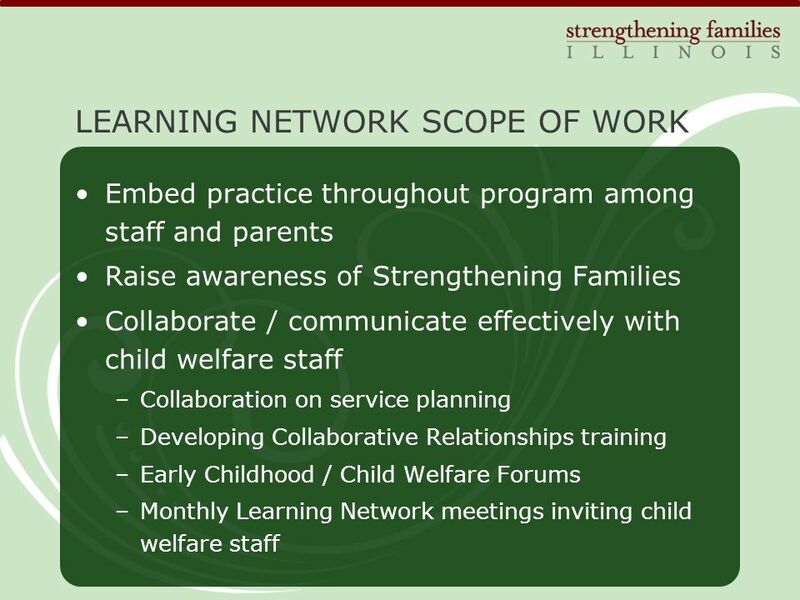 Family-School Partnerships and Healthy Schools Marianne Weant and Kelly Langston North Carolina PTA. 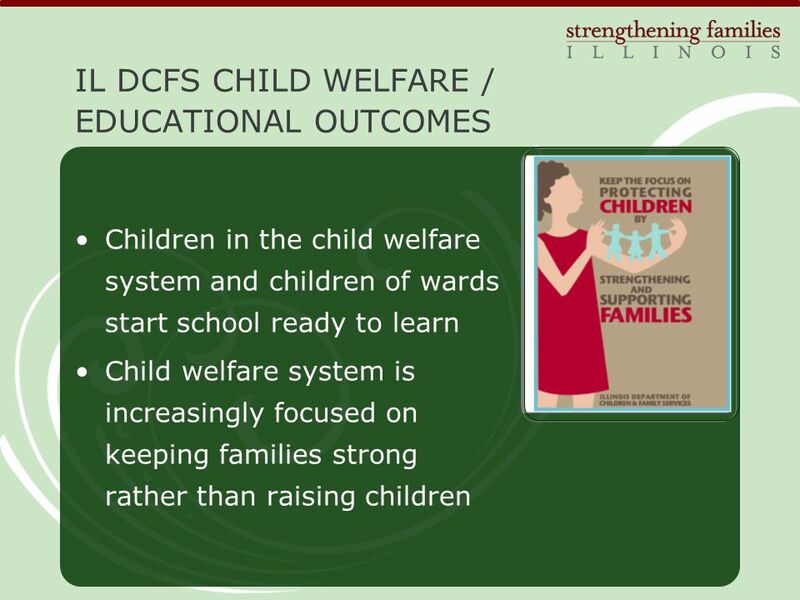 FAMILY PARTICIPATION OR ENGAGEMENT: A POWERFUL DISTINCTION THAT SUPPORTS POSITIVE OUTCOMES FOR KIDS Presented at the National Catholic Educational Conference. 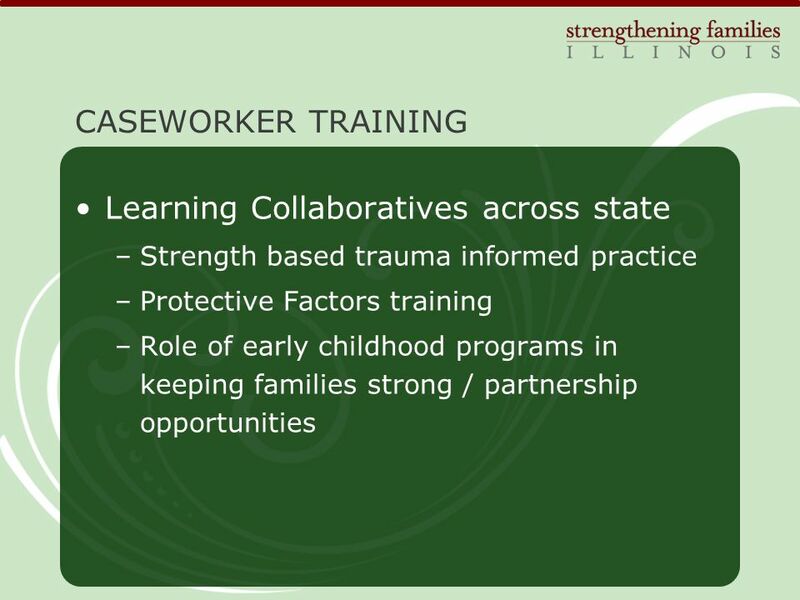 Developed by the Center for the Study of Social Policy Funded by the Doris Duke Charitable Foundation. 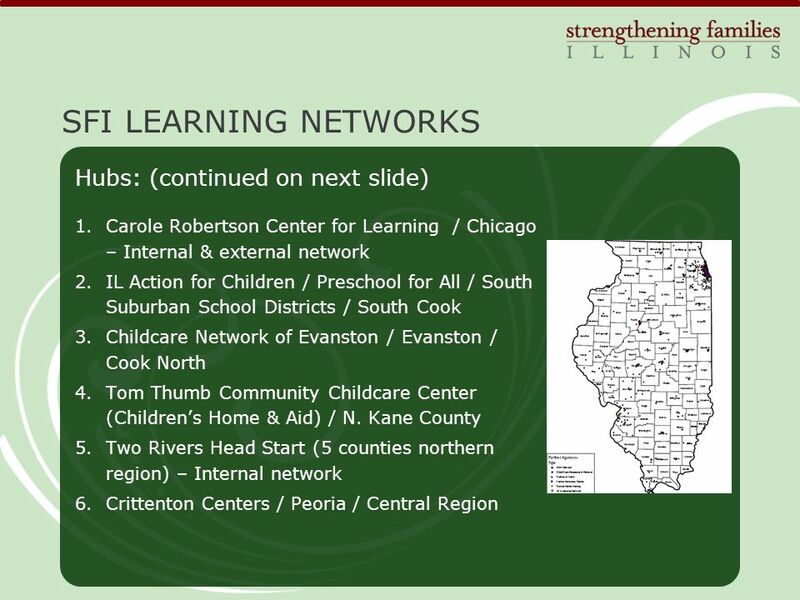 Common Ground One Approach, Many Adaptations Juanita Blount-Clark August, 2011.